President Bush said last night that "the situation in Iraq is unacceptable to the American people — and it is unacceptable to me." If he had said that long ago, instead of straining to put the best interpretation on so many distressing events, his credibility with the American public might not be at its current low ebb. His new plan to secure Baghdad and turn around the war will inevitably be greeted with skepticism from a public that has heard reassuring words before that have been belied by reality in Iraq. We share some of that skepticism, even as we applaud President Bush for committing the additional troops and resources to the war. At this late hour, the responsible options are almost down to supporting some version of the president's surge or supporting withdrawal. Because we think the war is still winnable and share the president's assessment of the dire strategic consequences of failure, we support the surge. But we can't be entirely confident it will work. Bush advanced two reasons for the failure of the prior Baghdad security plan: inadequate American and Iraqi force levels, and obstacles placed in the way of confronting Shia death squads by the Maliki government. The dearth of troops meant Baghdad neighborhoods were cleared of insurgents and terrorists, but not held afterwards, so the bad actors returned after we left. Five more U.S. brigades will head to Baghdad (and one more to Anbar), and Bush said this time we will "have the force levels to hold the areas that have been cleared." We hope that's true. We also hope that Bush's emphasis on having Iraqis take the lead is a diplomatic fiction, since the Iraqis obviously aren't yet up to waging a challenging counterinsurgency campaign in the midst of a civil war. As for Maliki, we wish we could be certain he will follow through on the commitments he has made to the administration. Reports in the press say he has given cleric-thug Moqtada al-Sadr an ultimatum to disarm or face an onslaught. This ultimatum could well end up being much less stark than it seems and resulting in the sort of messy compromise the Iraqis have made with Sadr in the past. What is important is that Sadr begins to be cut down to size, through military and political measures. Meanwhile, it will be progress if Maliki simply produces the forces he has promised to hold up his end of the Baghdad security operation, and if he hits the benchmarks mentioned by Bush last night: passing an oil-revenue-sharing plan, holding provincial elections, and reforming de-Baathification laws. His record thus far — as, basically, an ineffectual sectarian — doesn't inspire much confidence. It is a commonplace among opponents of the surge that there is not a solely military solution to the Iraq War. True. But unless the security situation is brought under control, Iraqi politics will continue to be radicalized. 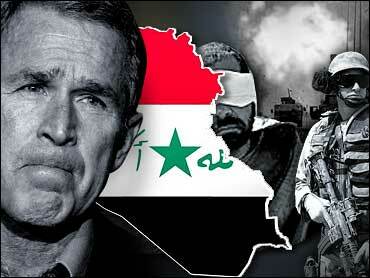 And President Bush cannot be accused of neglecting the non-military aspects of the war. His speech Wednesday night pledged not just more troops to the fight, but more embedded advisers, more training, more reconstruction aid, and more diplomacy in the region. The last, thankfully, won't be the kind of diplomacy pushed by the Iraq Study Group — talks with Syria and Iran. The fact is that our allies in the region are terrified that we will leave Iraq and that we will give away the store in negotiations with Iran, so they should be pleased with Bush's speech. As for our enemies, Syria and Iran, they were put on notice. In an underappreciated passage at the speech, Bush vowed to "seek out and destroy the networks providing advanced weaponry and training to our enemies in Iraq." It is one thing to have a healthy skepticism of the effect the president's latest push will have, and another to oppose it without either offering any plausible alternative or pushing all-out for a withdrawal. That is the position of many Democrats and the odd Republican, including the GOP presidential aspirant Sam Brownback. They all pretend that conditions in Iraq can be improved with the U.S. maintaining or even reducing its current level of effort. That is wishful thinking. The surge is the only realistic hope for checking Iraq's downward slide. More important than Bush's speech or any policy specifics is the big picture: He is still committed to winning in Iraq, he has identified population security as the key element of our strategy, and he is sending a talented counterinsurgency expert in the person of Lt. Gen. David Petraeus to run the war. Presumably, Bush will give Petraeus whatever resources the general says he needs going forward, and Petraeus won't be as blinkered as his predecessors. It is important that Petraeus get to Iraq as soon as possible, and be in a position to begin implementing the plan and adjusting it as it bumps against realities on the ground. In forthrightly acknowledging the failures of his prior Iraq policy and working to change them, Bush has done the right and courageous thing. Now it is a matter of following through. We wish him well, as should all patriotic Americans.